Mark Melzer of Melzer, Deckert + Ruder, Architects, Inc. came to us in Spring 2016 looking for a unique focal point of the entry lobby at the Kimpton Hotel Palomar in Beverly Hills, CA. The new fireplace would need to match the stunning design inspiration done by Craig Hardman of Dawson Design Associates, Inc. and also meet Los Angeles city requirements. Craig was looking for a double ring custom gas fireplace that would be crafted from hot rolled steel or cold rolled steel with a darker, black patina finish. This particular custom gas fireplace was being put into a commercial setting, so our Glass Cooling System was a must to avoid high glass temperatures. The custom rings were designed to be 3/4″ thick with removable glass panes for cleaning and maintenance. The fireplace stands at over 10 feet tall from base to the top of the outer ring and is a little over 2 feet deep and weighs in at about 4,500 pounds. 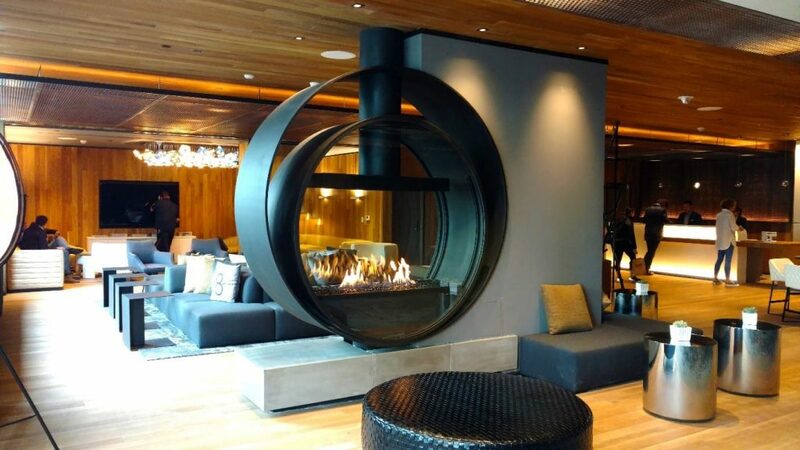 The outer ring is about 7 feet in circumference while the inner ring has a circumference of 6 feet and includes a 2 ½ foot line of fire custom linear burner capable of 35,000-45,000 BTUs. The photos above show the fireplace making its way from Production to Finishing and finally onto Testing before shipping to the customer. Every custom gas fireplace Acucraft builds are shipped to exceed ANSI standards and are internally tested in our test lab by Acucraft and by a 3rd party. We are honored to have been selected for this project and are thrilled with how this commercial gas fireplace turned out. It fits perfectly into the Kimpton Hotel Palomar’s newly redesigned lobby! This fireplace was definitely one of Acucraft’s most unique fireplaces built; it was a privilege working with all of the teams involved in bringing this design to life. We look forward to working on future projects!